Replacement mailbox flags are designed to replace a damaged or worn down mailbox flag. It's a good idea to replace them- some mail carriers won't know to pick up mail if you haven't erected your mailbox flag. Plus, if your house is faraway from the mailbox, you'll want the mailman to raise the flag to let you know mail has been delivered, rather than having to walk down the driveway and check it yourself. A real lifesaver if you or a loved one is dealing with a disability. One of our favorites is the Universal Mailbox Flag- it is designed to work with brick, wood, stone, stucco, metal or plastic mailboxes. It ships with different screws for different installations, and when you push it up it will click" in place. This lets you know that the flag is properly set. One installation tip: before you drill or screw it in to its final position, make sure you test out the flag's up and down position. Most users told us that installation wasn't too hard, though a few buyers had to put in some elbow grease (and drilling) for more complex installs. Designed to attach to plastic, wood, stone, metal or stucco mailboxes. This mailbox flag kit ships with fasteners for masonry installation, wood & metal/plastic mailbox attachment. Designed to be resistant to cold and hot weather climates. Engineered to resist fading from prolonged sunlight exposure. Requires 5/32" masonry rated bit, 3/16 metal rated bit or 5/32" rated wood bit. "Finger Grab" protects fingers while raising & lowering the flag. 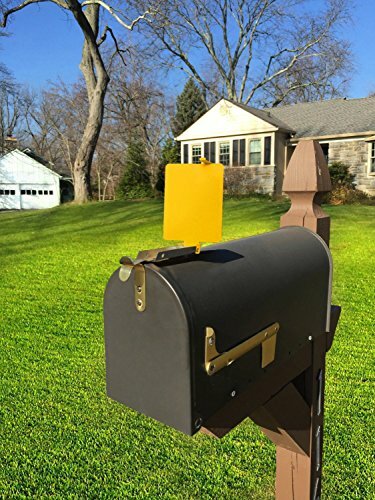 Let's take a look at 5 of the best-selling replacement mailbox flags on the market today. This mailbox replacement flag kit offered by Gibraltar is rust-proofed, inexpensive and well-made. Users love the bright red color, but some do note that the package arrived with missing hardware. 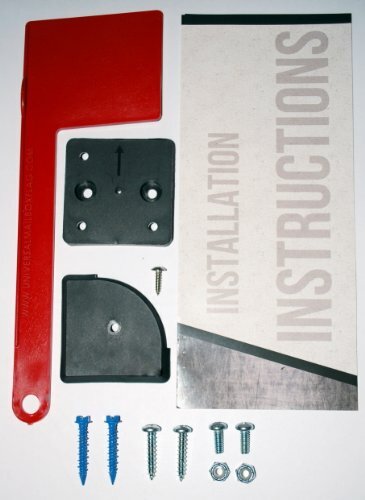 This alert flag kit is made of durable plastic, and it includes a flag, a bracket, all the necessary hardware and instructions for installation. This mailbox flag replacement measures 12” x 6” x 2” with a weight of 0.3 ounces, and it fits all USPS approved mailboxes. Overall, this is an excellent choice if you want an easy-to-install replacement mail flag. A user comments that it took him about five minutes to replace his old flag and that he is extremely satisfied with the quality of the Gibraltar mail alert. Another happy buyer mentions that this flag kit arrived quickly and it fit his mailbox with no issues. The reviewer also states that the kit comes with instructions where to drill holes if you have problems with the installation. A purchaser also shares that he bought two of the Gibraltar mailbox replacement flags and that he has been using them for months without any signs of wearing. He would recommend it to anyone looking for a cheap mailbox flag. However, some customers have complained that the mailbox alert flag needed some modification before the flag would fit their box. Some users also complain that the flag won’t stay upright and that it’s cheaply made. If you are in need of a new mail flag, you might look at this top-rated universal mailbox alert kit. Users love that the flag is easy to install, but some do note that it’s overpriced. 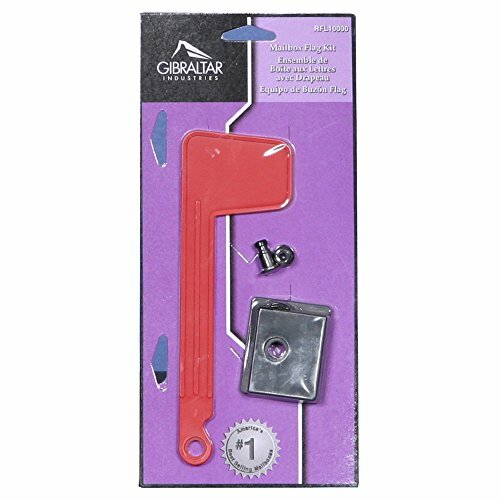 This universal flag replacement kit measures 11 x 5 x 0.5 inches, and it has a weight of 3.2 ounces, a durable fading-resistant plastic construction, and a finger grab design to protect your fingers when you raise and lower the flag. It’s suitable for all kinds of mailboxes from brick to plastic and it comes with all the necessary fasteners for masonry, wood, metal, plastic attachment. In general, buyers are happy with the functionality and usefulness of the universal mailbox flag. A user comments that he didn’t have any problems to install the flag on his masonry mailbox and that it took him less than ten minutes. The reviewer also states that the plastic looks sturdy and durable. Another customer shares that this universal mailbox flag works better than he expected and that it’s suitable even for stone mailboxes. The user would recommend it to anyone looking for the best mailbox flag replacement. However, some customers have complained that this flag kit is not really universal because they had to drill holes to make it work for their mailbox. Some buyers also complain that the mail flag is plastic, not metal and that they had some difficulties attaching it to the mailbox. This mailbox replacement flat kit offered by dVault is well-made, sturdy, durable and easy-to-install. Users love the price and the heavy-duty design, but some do note that they had to drill holes to make it fit. 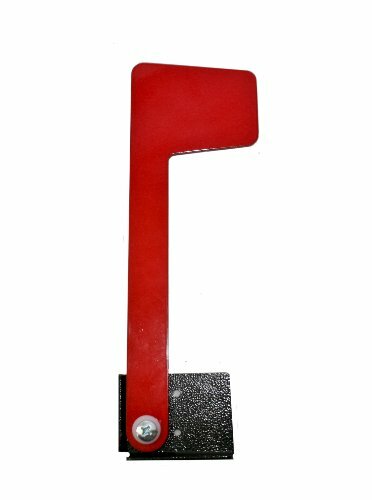 This flag alert kit has a rugged steel construction, durable power-coated finish, a weight of 1 pound and it comes with all the necessary mounting hardware and instructions for installation. This replacement kit is made in the USA, and it fits most mailboxes. Overall, this is an excellent choice if you are looking for a metal replacement flag. Overall, users agree that this is one of the best metal flag replacement kits available and they highly recommend it. A buyer comments that he has been using this alert flag for several months and he encountered no problems – the flag stays upright, and the metal doesn’t rust. Another reviewer mentions that he was surprised by the thick metal and that he expects it to last for years. A happy purchaser also shares that it’s a piece of cake to install this flag and that it will fit almost all mailboxes with some modification. The reviewer also says that he attached it to his plastic mailbox quickly. However, some customers have complained that the mounting screws are of poor quality and that it’s smaller than they expected. This automatic visual mailbox ball offered by Miles Kimball is sturdy, uniquely designed and easy-to-notice. Users love the bright yellow ball, but some do note that the mounting bracket is made of plastic. This automatic mailbox alert system measures 2.5” x 1.5” x 6.8”, and it has a weight of 0.8 ounces, metal and plastic construction, a 6 ½ inch-high spring-loaded ball, instructions and hardware for installation. 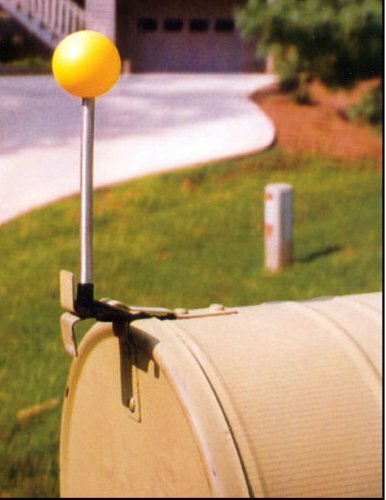 The yellow ball springs into a vertical position when someone opens the mailbox so that you can see it from afar. This mail alert kit could be an excellent choice for anyone that wants a different look for his mailbox. A buyer comments that he can see the bright alert ball even when he is several feet away from his mailbox and that he is extremely satisfied with the quality. Another user shares that he liked this automatic mail alert ball so much that he bought several as a Christmas present. The reviewer also says that it took him about several minutes to attach the ball to his mailbox. A happy customer shares that even after a year, the yellow mailbox ball still works smoothly. The user also mentions that except the color slightly fading, there are no other visible signs of damage. However, some purchasers have complained that they found it difficult to install the automatic alert ball and that it’s not suitable for all mailboxes. Some also note that the installation instructions are incomprehensible. This mailbox alert signal flag is well-designed, expensive and an excellent choice for anyone that wants a smart-looking mailbox. Users love its practicality and that it’s manufactured in the USA, but some do note that the spring is weak. This signal flag measures 6 x 4 x 0.8 inches with a weight of 0.3 ounces, and it’s made of rust-proof aluminum with a powder-coated yellow finish. It’s suitable for any metal and most plastic “bread loaf” mailboxes, but be aware that it will not fit a mailbox where the door is flush inside the box. In general, users have a high opinion of this yellow mailbox alert flag, and they praise its design, usefulness, and durability. A buyer comments that the bright yellow color is easy to notice from afar and that it saves him a couple of trips a day to the mailbox. Another customer shares that the mailbox replacement flag alert works without a glitch and that he gladly bought another one for his elderly parents. A satisfied user also mentions that the Mail Time mail alert is easy to install and he has been using it for years without issues. However, some customers have complained that the tab that keeps the flag down bends quickly and that the flag doesn’t stay upright. Some also note that the instructions are difficult to understand and follow. One of the first mailbox flags we took a look at was the replacement kit by Gibraltar. The manufacturers say that this kit makes upgrading a worn out/damaged flag very simple- check out this resource for installation tips. It’s constructed from durable, rust-proof plastic material. The company promises that the bright red color of the flag will catch the attention of your mail carrier very easily. Kit includes all hardware, flag, and bracket. Included instructions are easy to follow so that installation is quick. One Gibraltar buyer we spoke with stated it was bought to replace another junky mail flag. They had to make some modifications and tweaks to get it springing up and down the way they wanted. One other buyer said he had avoided replacing his flag after some local vandals tore it off. He was surprised to discover that these kits make it pretty easy to get a new flag erected quickly. The Universal Mailbox Flag was the next option we examined. The manufacturers say that it attaches to all brick, plastic, wood, stone, stucco or brick. Fasteners for metal/plastic, wood or masonry are included. Sunlight doesn’t cause fading and it won’t be affected by extreme cold or heat. In terms of installation requirements, 3/16 metal rated bit, 5/32” rated wood bit or 5/32” masonry rated bit required. One customer who bought the Universal Mailbox Flag stated that they were without a flag on the mailbox for years- an annoying inconvenience. Another buyer who bought this Universal Mailbox Flag and installed it on a masonry-style mailbox said that it was easy and only took 10 minutes for the whole process. It’s constructed of fairly sturdy plastic that doesn’t rust. Another buyer said her husband managed to put the Universal Mailbox Flag on in five minutes- a real easy install. They praised the quality, saying that she uses it every day and the installation was dead simple. Another buyer told us that the flag was bought for a stone mailbox he had built himself. The next option examined was the Steel Flag Replacement Kit. The manufacturers say that it is an ideal upgrade or replacement for an existing mailbox. It’s made of rugged steel with a powder coated durable finish making it more attractive and more resilient than a standard plastic flag. One customer who bought this kit said that it is a well-made replacement flag, though he had to do some drilling to get it affixed the way he wanted it. Another buyer said the quality of the metal base/flag was very good. The nylon washer on the screw holding the flag in place allowed tension to keep the flag up by tightening the screw. Another buyer said that generic, plastic replacement mailbox flags break often blow off quickly- this one hasn’t met that fate yet. One other buyer told us it worked as intended. He secured the flag to a brick mailbox. He told us that the thickness of the metal flag was surprising- definitely won’t be blown away. The bright yellow ball pops up to alert “mail call” to prevent wasted mailbox trips. When the mailbox is opened by the postal carrier, popping into a vertical position is a spring-loaded ball. The manufacturers say that it installs to most mailboxes and includes instructions and hardware. It comes in plastic or metal and the alert is 6 1/2” tall. One buyer of the Automatic Mail Signal says it is really fun to use and works exactly as promised. The bright yellow ball is highly visible- even from faraway up the driveway in rural areas. 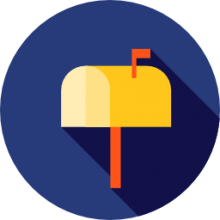 Another customer said the Automatic Mail Signal “ball” tells her that the mail has been delivered and since she is disabled, it saves her extraneous trips to the mailbox. One other customer said the little thing works great and is easy to set. It can easily be seen from the house over 100 feet away, and hasn’t been torn off by strong thunderstorms or naughty neighborhood children. It pops up whenever mailbox is opened by mail carrier. The last option we looked at was The Long Driveway Alert Signal by Mail Time! The manufacturers say that for over 25 years the original Mail Time! has solved the problem of determining when mail has been delivered, and indicating when mail is available for carrier pickup. It’s designed to work on any standard size mailbox. One Mail Time! buyer said it lasted over 18 years but the aluminum tip cracked and needed to be replaced. Another reviewer advised that you have to be gentle in handling the aluminum tip when periodically adjusting it for working properly. With daily erratic mail delivery, this product prevents excessive trips to the mailbox. Another buyer told us that modern electronic mailbox-delivery alerters aren’t as practical as the Alert Signal. Another buyer says for about 12 years they have used this product and just ordered their 5th. This user told us that the flag spring were made of stainless steel, it would probably last longer.